Jaisalmer described as the 'Golden city' of India because of the golden colour of the desert that reflects on the city. Jaisalmer is synonymous with forts, havelis, sand dunes and camel rides. Jaisalmer has a glorious history and a cultural heritage, which is now reflected in its ethnic cuisine, textiles and festivals. The Jaisalmer fort also attracts many tourists. If you have dreamt of a holiday in a historic city in the midst of sand dunes, then you should travel to Jaisalmer. 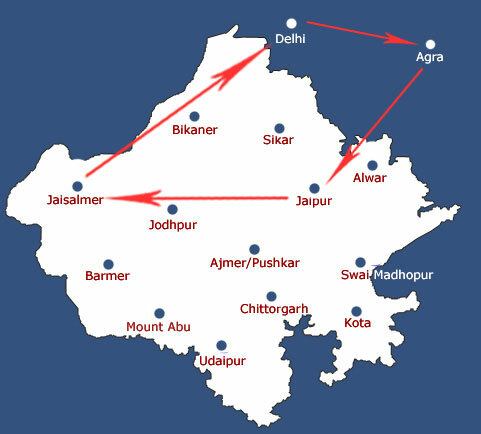 This tour itinerary gives you explore three historical cities of Northern India. Agra in Uttar Pradesh, known its wonderful Taj Mahal, which is the one of the seven wonders of the world. Jaipur is the capital of Rajasthan, known as a "Pink City" of India. Day 7 : Arrive Jaisalmer On arrival at Jaisalmer railway station, our representative will meet you to pick you up and transfer to your hotel. Rest of the day is at your leisure. Stay overnight at the hotel in Jaisalmer. Day 8 : Jaisalmer City Tour This morning proceed to city tour of Jaisalmer. Visit Sonar Fort- housing a fourth of city’s residents, Patwon Ki Haveli-one of the most exquisite havelis with a beautifully latticed facade, Salim Singh Ki Haveli- just three centuries old and is still lived in. Its arched roof is held up by well executed brackets in the form of peacocks. Nathmalji Ki Haveli built by two architect brothers is also worth admiring. Overnight at hotel. Day 9 : Jaisalmer to Delhi By Over Night Train Today you will be transferred to Jaisalmer railway station to board the train to Delhi. Overnight in Train. Day 10 : Arrive Delhi On arrival at Delhi Railway Station, our representative will meet your & transfer you to Airport for your onward Journey. All arrival, departure, sightseeing's as per above itinerary by Air-condition tourist car in Delhi, Agra, Jaipur, Jaisalmer, As per the above tour. Train tickets Delhi to Agra, Agra to Jaipur & Jaipur to Jaisalmer & Jaisalmer to Delhi By air-condition Trains.